The UNI 160x240 horizontal directional drill was specifically developed for heavy and long range construction applications. Grindex Pumps introduces a new generation of submersible heavy-duty drainage/sludge pumps for construction, tunneling and other industries. The 18GSTAP Trash Pump 18-inch workhorse is capable of achieving maximum flows in excess of 12,000 gpm and maximum total head of 135 feet. The new depressed center (Type 27) Ceramic Oxide grinding wheel is a high performance, bonded tool designed to handle a broad range of tasks including blending, deburring, shaping, sanding, finishing and polishing. Designed for the rugged cross-country pipeline market, the HD6 Pipeline pump is an all-purpose 6-inch pump producing flows past 2,700 gpm and heads to 165 feet, able to pass 3-inch solids. RIDGIDConnect is a subscription-based, online business tool designed for service professionals and contractors who create or use digital information. Hitachi excavators now feature engines with cooled exhaust gas recirculation (EGR) and exhaust filters consisting of a diesel oxidation catalyst/diesel particulate filter. The new M-Series S650 skid-steer loader and T650 compact track loader are now available for order through local Bobcat dealerships. Business news from LAN, Rain for Rent, Caterpillar, Ritchie Bros., US Composite Pipe South, CertainTeed, PPIC, Envista, JCB, Volvo CE, Terex and Gehl. <strong>LAN</strong> Planning, engineering and program management firm Lockwood, Andrews & Newnam, Inc. (LAN) has named E. Tyson Thomas, P.E., to the position of vice president. The Texas Section of the American Society of Civil Engineers (ASCE) held its 2009 fall meeting at the Hobas Pipe USA factory in The Woodlands, TX. Invited members toured the plant for an opportunity to expand their knowledge and learn how centrifugally cast, fiberglass reinforced, polymer mortar (CCFRPM) pipe is manufactured and used. An integrated oil and gas pipeline contractor, Driver Pipeline has been fulfilling the energy industry's construction, maintenance and repair needs since 1971. Headquartered in Irving, TX, near Dallas, the company has opened its fifth regional field office in Waskom, TX. <em>WaterWorks News: </em>The recent winter months brought about 150 water main breaks to the city of Jackson, MS. Some of the cities’ 100-year old pipes that are made of pit cast iron became brittle and were prone to breakage when the ground shifted due to the freezing temperatures, many of which are buried in clay. UCT has become synonymous for innovative technologies and services in the construction and rehabilitation industry – it’s the go to place for attendees who are looking for the latest innovations in the industry. UCT San Antonio offered exhibitors an opportunity to showcase their new products as the ideal venue to reach their customers. The Gulf Coast Trenchless Association has launched a new name to better reflect the association’s role within the underground construction industry. It has been said that good news travels fast. In a town like Lansing, MI, news travels slightly faster. The tight-knit capital community is, without a doubt, one of Michigan’s biggest small towns. So when construction hits, the word gets around. Most travelers are unaware of the complexity of engineering and constructing modern highways and streets, and many of the most critical elements that make a roadway safe and able to withstand heavy traffic for years into the future are not readily apparent. Liner Products LLC, a leading manufacturer of cured-in-place pipe felt tubes, recently dedicated a 42,000-square-foot expansion of its production and shipping facilities at an open house in Paoli, IN. "This time they've outdone themselves!" a UCT attendee told another as the two exited the RehabZone following the first round of standing room only demonstrations on the opening day of the 2010 UCT show in Tampa, FL. Members of the Power & Communication Contractors Association (PCCA) remained “resilient” in 2009 in spite of a worldwide recession. “The telecommunications crash of 2000/2001 forced the association and its members to diversify and to operate in a tight economy, and that experience helped the association and its members deal with challenges of the current recession." For Princeton, IL, a city of 7,500 residents, the future is now as it continues to modernize itself through a program that will eventually see all overhead electrical utility cables put underground. Tulsa, OK, has long been established as a principal base for oil and gas pipeline manufacturers, contractors and energy companies. While much of the industry has consolidated in Houston, Tulsa remains a principal manufacturing and service hub for the pipeline market. 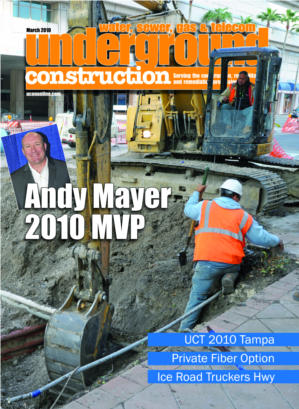 The 2010 Underground Construction Technology International Conference & Exposition – best known as the UCT show – was held in Florida for the first time in January at the Tampa Convention Center. For the second consecutive year, there were concerns that the continuing recession would impact attendance, and, in fact, final attendance figures showed a slight decrease from the number that attended the 2009 UCT in San Antonio. Even so, UCT was termed a success. For home internet users with broadband connections, "high speed" service usually is considered a necessity. Yet there are many regions in America that do not have broadband access, and an increasing number of small communities recognize attracting new business is unlikely to succeed without access to broadband. The debut of the Damage Prevention and Safety Conference at the 2010 Underground Construction Technology International Conference & Exhibition (UCT) got off to a promising start, said event coordinator Walt Kelly, and participants were enthusiastic about the content and value of educational sessions and hands on training. One of the most culturally diverse cities in the country, Albuquerque, NM, has the same problem as many municipalities--old and failing interceptor sewer lines. However, the Albuquerque Bernalillo County Water Utility Authority (ABCWUA) took a proactive approach to address this problem rather than a reactive approach of waiting for a failure. Harr Technologies' trenchless method of cleaning culverts and its successful use on projects in Alaska resulted in company owner Bob Harr being asked to help solve a critical problem threatening to close the James Dalton Highway, well known to American television audiences from the series Ice Road Truckers. President Obama's fiscal 2011 budget proposal (for the year starting Oct. 1, 2010) contains significant sums for the Clean Water and Drinking Water State Revolving Funds in spite of pressure to reduce non-defense, non-entitlement spending. From ductile iron to plastic pipe, PowerGrit technology requires less access to cut pipe in the ground. Utilizing a patented tri-cone roller bit and specialized drill head housing, the RS8 rock drilling system allows simple setup, low fluid usage, use of standard locator transmitters and excellent steering efficiency. The Aggressive Talon Rock Bit is a multi-use bit manufactured for HDD applications in a variety of soil conditions, including sandstone, shale and chunk rock. Ballantine offers a complete line of backreamers for nearly all ground conditions. The TriHawk II drill bit performs best when drilling in dry compressed soil conditions and is a good choice when drilling in hardpan, dry clay and any other compacted soils. The RockReamer is a versatile, cost effective hole opener for HDD – cutting downtime as easily as it cuts rock. The Ogre stacked plate reamer performs in hard soil conditions including shale, sandstone, caliches and cobbles. Go Green with the Direct Bore featuring a box end housing with a new stronger door, designed to take the abuse of those tough condition bores. The Fly Cutter is ideal for use during directional drilling operations in clay and sand soil conditions. INROCK's XTR platform utilizes an interchangeable block segment cutter (MT/TCI). Sharewell’s heavy-duty LTX series of Lo-Torque Hole Opener is ideal for pipeline projects. Cured-in-place pipe rehabilitation technology for sewer systems has been an industry force for decades. The technology is generally well-accepted as an excellent trenchless alternative to dig-and-replace. Ritchie Bros. Auctioneers is selling its former 40-acre auction site off the I-10 East Highway during an upcoming two-day unreserved public equipment auction at the company's new Houston permanent auction site, 15500 Eastex Freeway in Humble from March 24 to March 25 starting at 8:00 a.m. each day.